When students are learning to read and analyze the visual and auditory patterns found in the natural world and in the work of authors, photographers, scientists, artists, and filmmakers, they need to practice active viewing strategies. With practice, students will progress from passive to active consumers of graphic and media texts and to thoughtful composers of their own multimedia compositions. Each italicized title in the Viewing Strategies Organizer is more fully discussed in the links at this site. 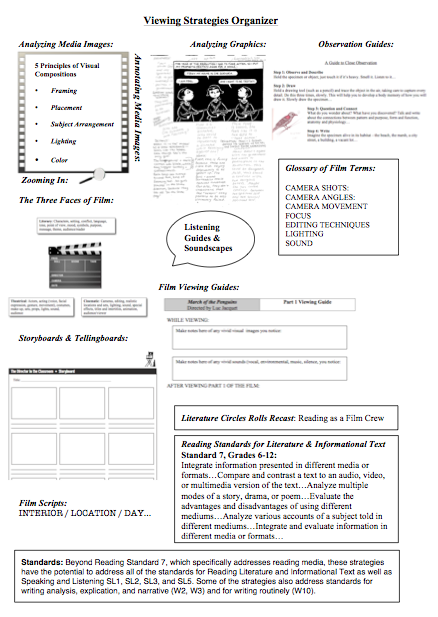 Click here for a user-friendly handout of the Viewing Strategies Organizer.